When a woman is diagnosed with breast cancer, the last things on her mind are day-to-day needs such as paying bills or finding reliable transportation to get to doctor’s appointments. That’s why the local chapter of Tough Enough to Wear Pink (TETWP) has a program called “Friends of Pink.” This Coming weekend, TETWP will host its second annual hockey event called “Pink in the Rink” with proceeds going toward the Friends of Pink program. Four women’s teams will compete for the top honor at the tournament — the championship game will be played on Sunday. A men’s tournament has also been organized this year. The Gunnison Roping Club will teach how to team rope, and in case you didn’t get enough during Cattlemen’s Days, there will be a mechanical bull for you to try. Burnell’s Food Truck will be on site and music will be playing. Sherratt Bogart said the purpose of this year’s event really hit home for her. A woman who is well known in the valley for playing goalie and has participated in past TETWP events will not participate in this year’s tournament. Sherratt Bogart said sponsors have been very generous. Combined with money raised during the event, she hopes to top $15,000 before the weekend is through. Friends of Pink provides financial assistance to patients with a breast cancer diagnosis. Such help includes covering missed mortgage payments, medical bills, and travel costs, among other expenses. The program also helps clients get to appointments out of the area in the “Toughy” transportation truck and helps with funding integrative therapies at Gunnison Valley Hospital, such as massage or counseling. 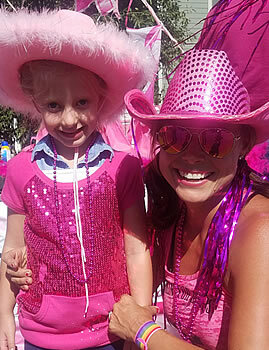 For more information on Pink in the Rink and a full schedule of events, visit https://gunnisontetwp.com/pink-rink-womenshockey-tournament/.